Since 2004, businesses in Bristol and Bath have been using Freight Consolidation to manage their deliveries more effectively, saving staff time and optimising storage space. 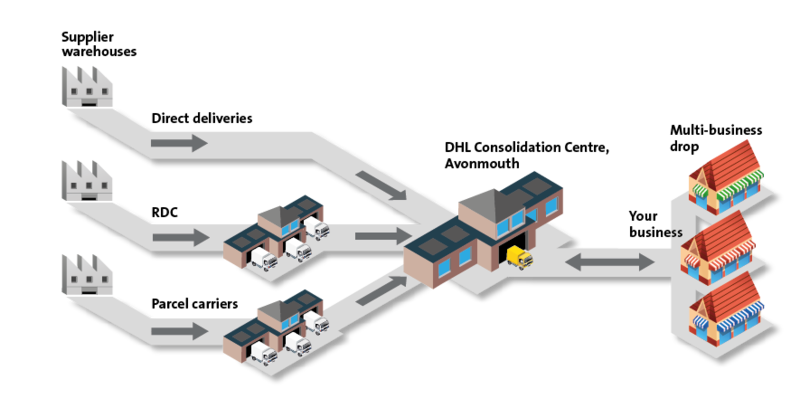 Freight Consolidation cuts the number of separate deliveries you receive. Goods from different suppliers can be bundled into one pre-arranged delivery at a time convenient to your needs. Orders need only be signed for once and we can even take away excess packaging at no extra cost. If storage space is a limitation, you can have bulk stock held at our depot until you need it in store. The Freight Consolidation service is a partnership between courier service DHL and the Councils in Bristol and Bath. Using a small number of electric vehicles instead of numerous diesel trucks helps to free up busy roads within these cities and results in cleaner air. Bath and North East Somerset Council aims to reduce traffic in the historic core of the City and has introduced a new traffic restriction, which prevents vehicles on certain roads between 10am and 6pm. Because Freight Consolidation contributes towards the objective of reducing vehicle numbers, the service has been exempted from the restrictions – meaning that customers in this area can still receive their deliveries throughout the day. Have your supplies delivered to our depot in Avonmouth, instead of your business address. We combine your separate packages for more efficient transit. Your delivery is made at a time of your choosing. You can arrange a regular schedule* or receive next day delivery of stored items. *Items arriving at our warehouse before 7am can be delivered same day. We can take stock directly to your store room and remove excess packaging for recycling. Switching to Freight Consolidation is easy – we’ll take care of everything for you. And, if you’re not totally satisfied with the service, we’ll even help you to switch back. In 2015 Bristol City Council commissioned research to be carried out to discover what the level of awareness was of the Bristol and Bath Freight Consolidation Centre and whether there would be any appetite to use the service or expanded services in the future. This report is the outcome of that research and will help us to look into new ways of operating in future to reduce the number of freight vehicles on our streets.